"Why should China say no to 'wrong Western values'"? asked an editorial published on the People's Daily, a mouthpiece of the Chinese Communist Party (CCP). The editorial was written in defence of the recently announced ban on university textbooks promoting 'Western values'. According to the paper, Western people misunderstand China. They do not realise that human rights are not universally applicable. Although China protects and values "liberty, democracy, equality and human rights", the country's history, tradition and customs are different from the West's, and therefore China cannot simply copy the West's multi-party political system or passively adopt its understanding of human rights. "There is no universal criteria to judge political values," writes the People's Daily. "Therefore, China must assimilate western values within its own political culture. Otherwise, it could ruin the future and fate of the entire nation." The concept of liberty, which "is cherished the world over, including in China", has a different meaning in China and in the West, argues the article. While in Western political thought liberty "is based mainly on the individual", according to "Chinese traditions and Marxist ideology" liberty is based on "collective liberalism." China, adds the paper, cannot exist without the CCP. "History has told the Chinese that denying the leadership of the CPC [=CCP] and socialism leads to chaos and stagnation." If these premises are true, than why should China not ban 'wrong Western values' that are not compatible with China's development, history and current situation? Why should China, as a sovereign and independent country, not ban such wrong ideas from its universities? But are these premises true? First of all, we should ask ourselves what the People's Daily exactly means when it talks about the West. The state media of the PRC seldom explain what they mean by this term, in fact, they seem to be very confused about it. 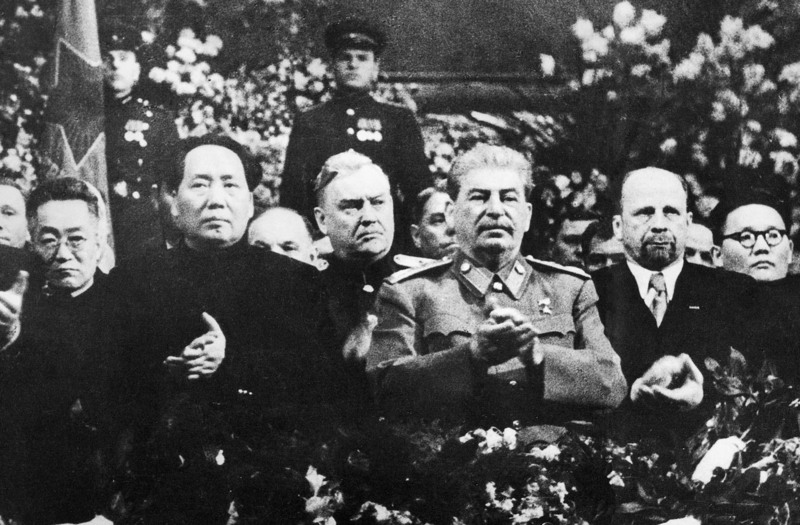 The PRC easily forgets that Communism is just as Western as democracy or Fascism. It forgets that even political parties and constitutions are Western concepts. The only truly Chinese form of government is the old imperial, Confucian state that collapsed in 1911. Mao Zedong knew very well that Communism was not an indigenous Chinese ideology, and he not only saw the Soviet Union as a master from whom to learn how to build a socialist country, but he also regarded China's Communism as an integral part of world revolution. Living in a period of the bitterest suffering in our history, we Chinese people most urgently need help from others ... Only the land of socialism, its leaders and people, and socialist thinkers, statesmen and workers can give real help to the cause of liberation of the Chinese nation and the Chinese people, and without their help our cause cannot win final victory. This shows that China's Communist revolution was not just a Chinese revolution, but it was achieved with the help of foreign powers. As a Communist ideologue, Mao firmly believed in the distinction between good socialist countries and evil capitalist-imperialist countries. Therefore, he was not ashamed to ask for the help of his Communist allies in other countries. Our general task is to unite the whole people and win the support of all our friends abroad in the struggle to build a great socialist country, defend world peace and advance the cause of human progress. The people of our country should work hard, do their best to draw on advanced experience in the Soviet Union and other fraternal countries ... Ours is a just cause. A just cause is invincible before any enemy. The force at the core leading our cause forward is the Chinese Communist Party. The theoretical basis guiding our thinking is Marxism-Leninism. The Russians made the October Revolution and created the world's first socialist state. Under the leadership of Lenin and Stalin, the revolutionary energy of the great proletariat and labouring people of Russia, hitherto latent and unseen by foreigners, suddenly erupted like a volcano, and the Chinese and all mankind began to see the Russians in a new light. Then, and only then, did the Chinese enter an entirely new era in their thinking and their life. They found Marxism-Leninism, the universally applicable truth, and the face of China began to change. Mao Zedong's arguments contradict the exceptionalism propagated by the CCP nowadays. For Mao, there was a universal truth: Marxism-Leninism; China needed foreign help; China was part of a great world movement. However, after Mao's death the CCP abandoned Marxism-Leninism and took refuge in a simple rhetorical stratagem: the return to the market economy is called "the primary stage of socialism" (see e.g. Xi Jinping: The Governance Of China ). The public in China has not been told how long the primary stage of socialism will last, how it will end and what will happen afterwards. As long as the CCP does not lay out a clear vision of how to implement Marxism-Leninism in China, it is fair enough to assume that the "primary stage of socialism" theory is just a trick that hides the fact that Marxism-Leninism has failed. China was, in fact, closer to Marxism-Leninism under Mao than it is now. Why should the country have returned to the market economy and undo most of Mao's collectivisation, which had indeed eliminated capitalism, if the CCP truly believed in Marxism-Leninism? The second question that the People's Daily editorial raises is why Communism is good for China but other political systems are not. Marx and Engels were Germans. If the political theories of two German thinkers are good for China, then why is democracy not good for China? The CCP does neither explain what 'Western' means nor does it tell us according to what objective criteria it tells 'good' from 'bad'. It does not explain to us why Communism, which is a Western doctrine, is good for China, while other Western doctrines would allegedly destroy it. The Chinese Communist Party is not indigenous to China ... It is an outgrowth of Soviet Russia and the Communist empire. Because of its incompatibility with tolerable human existence and still less with the structure of Chinese society, this offshoot of Soviet Communism in its early formative stage had to hide in and to live as a parasite on Kuomintang so that it could grow and organize workers, farmers and the masses through Kuomintang organs and to stir up class struggle under their cover. Its aim was to set up in the course of China's wars of unification and independence a Soviet puppet regime and to create the first satellite in Asia (Chiang Kai-Shek: Soviet Russia In China : A Summing-Up at Seventy, 1957, p. 11). The Republic of China (ROC) miserably failed on the mainland. However, on Taiwan the ROC achieved great successes. If Taiwan has achieved a high level of economic, social and democratic development, which is rationally measurable, why are its principles not good for China? If China claims that Taiwan is part of its territory, then Taiwan's development is a proof that Communism is not the only path the Chinese can follow. Hong Kong, too, has thrived without Communism. The claim of the CCP to be the only legitimate ruler of China therefore lacks evidence. Using history, culture and customs as an argument to defend a one-Party regime or to ban thoughts that the Communist leadership dislikes is just an excuse. Surely enough, no other country has the right to interfere in China's internal affairs. But the PRC does not have the right to intoxicate people with naive and illogical propaganda. If they want to be in power and to continue their one-Party dictatorship, they might as well do so without pretence, without constantly mixing incoherent and miscellaneous principles in order to convince the world's public opinion of the righteousness and inevitability of their regime. They might very well admit that without an army and tight censorship this regime would simply collapse.